This week, 26 County Finance Minister Michael Noonan and Taoiseach Enda Kenny joined forces with their German counterparts to intensify pressure on the Greek government to further humiliate and impoverish their own people. Kenny issued a straight “No” when asked if the 26 County state would support a write-off of Greek debt, and a claim that the state had emerged from its crisis by pursuing “pro-growth policies” without raising taxes generated ridicule and condemnation. Sinn Fein leader Gerry Adams TD slammed the comments. Sinn Fein MEP Matt Carthy described the government’s position as shameful. He said the decision of the Dublin government to “side with the right wing elite of Europe” had placed Ireland “on the wrong side of history”. Earlier in the week, Finance Minister Michael Noonan was among the toughest contributors in talks on the EU’s response to the Greek crisis. At a heated finance ministers’ meeting, Mr Noonan and his German counterpart, Wolfgang Schaeuble, argued that Europe could not approve further emergency loans to Greece without capital controls, cuts to Greek welfare supports and tax hikes. Socialist TD Paul Murphy accused the Minister of fuelling an “economic and humanitarian crisis” in Greece. During Leaders’ Questions in the Dublin government, Mr Murphy said Noonan had “stabbed the Greek people in the chest and, in so doing, he stabbed the Irish people in the back”, adding that a debt writedown deal for Greece would also be good for Ireland. He said that unelected European Central Bank figures had “a noose around the neck of the Greek economy” and Noonan and Schaeuble were lined up to “tighten the noose”. 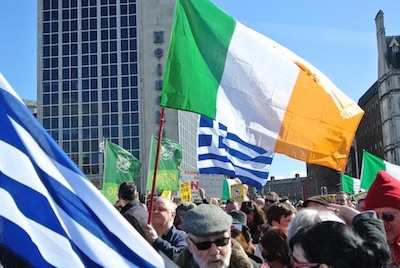 Opposition politicians believe the Dublin government shares the ECB’s objectives in Greece because any example of successful defiance would expose their own compliance with the IMF and the EU at the expense of their own people. Despite the government’s fanfare over Ireland’s economic growth figures, child poverty is now almost double what it was before the crisis began and more than a thousand children are currently homeless in Dublin. In the latest savage cut, the One-Parent Family social welfare payment was removed this week for single parents whose youngest child is over the age of seven. Thousands marched to the GPO in Dublin last weekend as anti-austerity and anti-water-charge protestors returned to the capital. There were a number of Greek flags on display as campaigners used the event to show solidarity with that country. “This is a peaceful protest and one that is being taken in solidarity with the Greek people,” said one of the protesters. Emerging from the talks this week, the Greek prime minister Alexis Tsipras inspired supporters when he said he would put his people first, not creditors. Last night, in a televised address to the nation, Mr Tsipras announced that he will put the the latest ultimatum from the EU and the IMF to a referendum on July 5. In his speech, Tsipras used very strong language and said the proposals being urged on his government directly violate the European social and fundamental rights. “Concerning work, equality and dignity, the aim of some of the partners and institutions is not a viable and beneficial agreement for all parties but the humiliation the entire Greek people,” he said.